David Fray, piano; Jaap van Zweden, Philharmonia Orchestra. Virgin Classics 50999 641964 0 4. 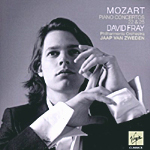 French pianist David Fray is one of those fellows who looks a lot younger than his age, so don't be put off by his youthful appearance on the disc's cover photo. He was actually around thirty when he made these recordings. More to the point, I had never heard the man play until now, and I was curious about his attitudes and abilities. Even though his Mozart interpretations did not overwhelm me, I could readily understand his intentions, and there is no doubting his artistic skills. Fray begins with Mozart's Piano Concerto No. 22, K.482 (1785). Here, we see Mozart in an amusingly lighthearted yet lyrical mood, much of which Fray conveys handily (he's quite virtuosic). However, it's when one compares his performance to those of Daniel Barenboim (BR Klassik) or Murray Perahia (Sony) that one notices a slight lack of spark, geniality, or joy from Fray. I don't hear the same playfulness or vitality in Fray's playing that I do in the other artists, although I have to admit that the Virgin engineers recorded Fray marginally better. Certainly, there is nothing wrong with Fray's interpretation per se, except that it is a little straightlaced. Then it's on to the Piano Concerto No. 25, K.503 (1786), where Fray seems to me more successful than in No. 22. The piece is more dramatic, and Fray communicates its operatic theatricality most clearly. One can hear fairly easily the connections to the composer's Die Zauberflote, which he wrote a few years later, with Fray doing his best to play up those ties. The concerto's Andante exhibits an appropriate dignity, but the concluding Allegretto is a tad too sober for my taste while nevertheless voicing a pleasant sense of delicacy and passion throughout. The Philharmonia, always one of London's most refined orchestras, provide able-bodied accompaniment under the guidance of Maestro Jaap van Zweden. Still, I found myself wishing the orchestral support had been a tad more spry and lively and a bit less refined or able-bodied. Virgin recorded the music in Abbey Road Studios, London, in August of 2010. The sound is pleasantly reverberant, smooth, and well balanced. The engineers capture the piano in an almost ideal position relative to the orchestra, with just enough bloom on the instruments to simulate a live experience without the annoyances of an actual live performance. Dynamics and frequency range are adequate to the occasion, and overall definition is fine. Also, Bird: Serenade; Reed: La Fiesta Mexicana. Harlan D. Parker, the Peabody Conservatory Wind Ensemble. Naxos 8.570242. My first thought before listening to this disc was how the already rowdy Carmina Burana by Carl Orff (1895-1982) would sound played by an all-wind band, the vocal parts revised for instruments (arranged for concert band by John Krance). I mean, Orff's twentieth-century updating of medieval songs normally requires a full orchestra, several choruses, and a host of soloists. Would a wind ensemble do it justice or just inflate its coarseness? I'm pleased to report that Harlan Parker and his seventy-odd Peabody Conservatory players do no harm to the piece and in most ways create a new and engaging rendition of an old favorite. This is by way of saying that you'll recognize the music instantly and find each movement in the twenty-seven-minute suite revealing something you perhaps hadn't thought of before. The Peabody Wind Ensemble of John Hopkins University play with precision, if not with the complete zest and joy that I have heard from some major orchestras; in other words, they sound like they are maybe a little reticent about committing too much enthusiasm to a set of songs that requires a bit more earthiness. They are not stuffy, by any means, but they don't have the robust, unaffected air I find in, say, Previn's EMI recording, Blomstedt's Decca, or Jochum's DG. 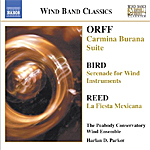 Anyway, the Orff piece is just the most-familiar item on the disc; the album also contains a small-scale chamber work, Arthur Bird's Serenade for Wind Instruments (1898), which is quite charming, if forgettable; and Herbert Owen Reed's La Fiesta Mexicana (1954), a wonderfully varied and robust piece of music that has a little something in it for everybody, including a striking opening movement with trumpets and simulated fireworks. It took a moment or two for me to adjust to the Naxos sound. At first, I thought it was a bit boisterous. A couple of minutes later, it seemed to fit the music. About halfway through the Orff, I realized it was not only appropriate, it was almost perfect. And by the beginning of Reed's La Fiesta, I thought it was downright spectacular. There is a picture of the ensemble in the booklet insert, and that's almost exactly what the sonic image sounds like: eight-to-ten players per row and about six rows deep, recorded at a modest distance. Depth of field is excellent; dynamics are strong; and clarity is more than acceptable. It's a topflight recording to complement a set of splendid performances. Trios Hob. XI: 35, 87, 97, 101, and 124. The Esterhazy Machine. Smithsonian FoM 36-811. First things first: What is a baryton, and what the heck is an Esterhazy Machine? A baryton, according to my Random House Dictionary, is "an 18th-century stringed instrument with six bowed strings and several additional strings that vibrate sympathetically." The disc booklet amplifies on that, saying that "Leopold Mozart, Wolfgang's father, described it as 'one of the most charming of instruments. Like the gamba, it has six or seven strings. It has, however, a very wide neck, the back of which is hollow and open and into which nine or ten brass and steel strings are inserted, which may be plucked by the thumb while the principal part is played with the bow on the gut strings.'" 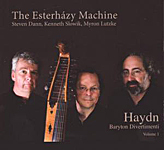 As for the Esterhazy Machine, it's the group name for three players of international renown in their own right: Kenneth Slowik, artistic director of the Smithsonian Chamber Society, soloist, conductor, and recording artist, on baryton; Steven Dann, principal violist of Amsterdam's Royal Concertgebouw and other orchestras, soloist, and recording artist, on viola; and Myron Lutzke, principal cellist of the Orchestra of St. Luke's, prominent Baroque and classical soloist, and recording artist, on violoncello. The group's name derives from a remark by Dutch cellist Anner Bylsma, who referred to the baryton as "that Esterhazy machine." The five trios for baryton presented on this disc range from brief (about nine minutes) to less brief (about twenty-two minutes), generally in traditional three-movement arrangements, with one of them, the Trio in D major, Hob. XI: 97, in seven movements (written longer in honor of Prince Esterhazy's birthday). In common they exhibit a pleasant, relaxed tone, much of it sweet, pastoral, witty, and serene. The trios are exceptionally tranquil and totally delightful. The three players, using period instruments (or in the case of the baryton, a facsimile), provide comfortable, gracious, refined interpretations of the music. As each man is a well-established artist individually, the question I had going in was how well they would perform as a group. Obviously, the answer is sensationally well. The three instruments emerge as one, with rich, luxuriant textures provided by the baryton, and the accompanists blending in seamlessly and effortlessly. The ensemble play as one, as though born to the music, which they never rush and never make less than enjoyable. Recorded at Dekelboum Concert Hall of the Clarice Smith Performing Arts Center, University of Maryland at College Park, in 2004, this 2010 Smithsonian FoM (Friends of Music) release sounds splendid. Like their other recordings, this Smithsonian issue provides enough hall resonance to give one the feeling of being in the room with the players, yet there is never so much reverberation that it obscures inner detail or transparency. These are immaculate aural presentations that never spread the ensemble out too widely but give them just enough distance left to right and front to back to produce an almost uncanny realism. The warm acoustic suits the mellow style of the music, the disc's audiophile quality a pleasure to the ears. Chamber Music by Walter Rabl and Josef Labor. Orion Ensemble. Cedille CDR 90000 088. For those listeners longing for the strains of serious Romantic, lyrical, tuneful, melodious music they don't already have many times over in their collections of basic-repertoire items, there is still hope. The folks at Cedille Records offer this disc of première recordings by composers Walter Rabl (1873-1940) and Josef Labor (1842-1924). Obviously, neither man is a well known composer, but that's the point, and they are both worth a listen. Things start with Rabl's Quartet in E-flat major for Clarinet, Violin, Cello, and Piano. It's a piece he wrote as a young man in 1896 for a competition of the Vienna Musicians' Society, whose honorary president at the time was Johannes Brahms. The Quartet won first prize, Brahms greatly admired it, and then people quickly forgot it, possibly because Rabl himself quit composing music shortly thereafter and turned his attentions to vocal coaching and conducting. In any case, the Quartet is a lovely piece, reminiscent of the work of Schumann (and Brahms). It's fairly simple in its traditional four-movement execution, but the melodies spill forth in abundance, and one cannot help feel the piece's serenity and good cheer. Then we get Josef Labor's Quintet in D major for Clarinet, Violin, Viola, Cello, and Piano, from around 1900. It, too, sounds as though it had a strong connection to Brahms, and it is, if anything, even more dreamily Romantic than Rabl's piece. Why the public neglected it is anybody's guess. The booklet note suggests that perhaps Labor's "blindness may have limited his ability to disseminate and promote his works." Anyway, like Rabl's Quartet, the clarinet dominates Labor's Quintet, the clarinet a wistful, sometimes mournful instrument if ever there was one, and in both pieces it works its magic in still, quiet, longing Adagio movements and energetic, rhythmic Allegros. The Orion Ensemble, consisting of five accomplished female musicians, play with refinement and grace; and, as always, Cedille's chief engineer, Bill Maylone, captures the sound in a wholly natural and realistic setting. The delineation is a tad on the soft side, but it only serves to emphasize the Romantic nature of the music. Also, Gershwin: Cuban Overture; Ravel: Daphnis et Chloe Suite No. 2; Wagner: Prelude and Liebestod from Tristan und Isolde. Daniel Barenboim, Chicago Symphony Orchestra. Warner Classics 2564 69816-5. 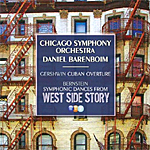 This 2010 release collects together four recordings Daniel Barenboim made with the Chicago Symphony during his tenure there as Music Director in the 1990's and early 2000's. Interestingly, they come originally from three different record labels--Erato, Teldec, and Warner Classics--so, if anything, the listener gets a chance to hear and compare the different sounds these companies and their audio engineers afforded the players. The program begins with the Cuban Overture (1932) of American composer George Gershwin (1898-1937). This is a colorful piece of music, with plenty of vitality, so it's hard for anyone to go wrong with it. Barenboim brings out most of the work's forward drive and is never too hectic about doing it, providing the slow middle section a commendable serenity. It makes an enjoyable curtain-raiser. Next is the centerpiece of the album, the Symphonic Dances from West Side Story by American conductor and composer Leonard Bernstein (1918-1980). Many of us tend to remember Bernstein mainly as a conductor of the New York and Vienna Philharmonic orchestras and maybe forget that he was also a prolific composer of works like Fancy Free, On the Town, Wonderful Town, Candide, On the Waterfront, several symphonies, numerous smaller pieces, and, of course, the monumental Broadway success, West Side Story (1957). Here, we get the ten-movement suite of orchestral music from the show, his Symphonic Dances (1961). Almost any listener will recognize the tunes, with Bernstein's familiar Latin rhythms and streetwise jazz style. Although Barenboim lingers a bit too long in the slower Adagio sections like "Somewhere," tending to over sentimentalize them, this is a musical of high emotions, after all, so we can probably excuse his few indulgences. After all the energy of the jazz-inflected American selections, the concluding Ravel and Wagner tracks seem oddly out of place, even disconcerting. However, Barenboim is moderately effective in them, so all is not lost. He presents Maurice Ravel's little Suite No. 2 from Daphne et Chloe (1912) with subtle charm, building appropriately to an exuberant finale. Then we get Richard Wagner's Tristan und Isolde Prelude and Liebestod, the music about as far removed from Gershwin's Cuban Overture as you can get. Wagner's music is possibly the most-romantic material ever written, and while Barenboim's approach doesn't seem as totally impassioned as it might be, the Chicago Symphony Orchestra plays it exceptionally well, which goes a long way toward making it worth our attention. Warner Classics recorded the Gershwin and Bernstein tracks in Medinah Temple, Chicago, in 1997. The sound exhibits a wonderful sense of hall space and orchestral depth but also a rather edgy high end and a somewhat thin bass. Erato recorded the Ravel piece in Orchestra Hall, Chicago, in 1991, and Teldec recorded the Wagner in Orchestra Hall in 1993. These latter works sound altogether warmer and smoother, even though they're not as dimensional. They make up for their comparative lack of sparkle by being more suave, more refined, the acoustic a touch softer and more resonant. Also, Final Ballet from Idomeneo. Marc Minkowski, Les Musiciens du Louvre. Archiv Production B0006506-02. Anyone wishing to own a recording of Mozart's final two symphonies played on period instruments before a live audience could do worse than Marc Minkowski's performances with the Musicians of the Louvre. As for the hyperbole surrounding the cover-jacket pronouncements, I have my doubts. I quote: "Mozart's late G minor Symphony has rarely had an interpretation so revolutionary." And "Two favorite symphonies as you've never heard them before." Well, if by "revolutionary" the writer means "fast," I'd agree. And insofar as the part about "as you've never heard them before" goes, I would have to say that's true: I had never heard Minkowski perform them before. Yes, the readings are smooth and passionate and lovingly played. No, they are not particularly "revolutionary." Minkowski does take them at mostly a brisk tempo, however, with a good deal of gusto from the tympanist playing in the "Jupiter." There are also what have to be the longest breaks between movements I've ever heard on a recording or in a concert hall, some ten-to-fifteen second breaks, in fact. That was the only annoying part of the proceedings. As far as the sound is concerned, it's fine, especially considering its live origins. There is no audience noise, and unless I had read the cover blurb stating that it was "Recorded live at the MC2: Grenoble," I would not have guessed. Thankfully, there is no applause involved. However, the sound is a trifle dull unless you turn it up a bit. Even then, it is not very transparent or dimensional, a thin veil shrouding a lot of the high end. But, as I say, the tympanist does have his way with things, banging away full throttle and creating quite a sensation. Charles Munch, Boston Symphony Orchestra. JVC JMXR-24028. 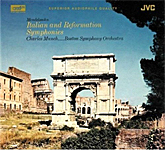 There is certainly no dearth of good Mendelssohn Fourths available these days (Abbado, Blomstedt, Sinopoli, and Klemperer are among my favorites), but one of the earliest great stereo versions and one of my first recollections of the piece is this one by Charles Munch and the Boston Symphony, recorded in 1958. Coupled with an equally good Mendelssohn Fifth Symphony from 1957, the album would be an easy recommendation if it weren't so expensive. But you get what you pay for. Munch's interpretation of the "Italian" Symphony has all the forward drive you could want, with plenty of adrenaline flowing in the famous first movement. What surprised me, though, was how much I liked the accompanying "Reformation." I don't suppose it should have surprised me; it's a splendid piece of music. I just keep thinking of it in terms of its slow, grave opening movement, rather than its wonderfully light second movement Allegro, a movement that harks back to the "Scottish" Symphony in its delightful, folksy simplicity. Needless to say, Munch makes the most of it. RCA make the album available in their "Living Stereo" line, but if you're willing to look for a European import, JVC offer it here, remastering it as well or better than it has ever been available to the public before. Like other Munch editions, there are things to like about the sound and things maybe not to like. It is an exceptionally vivid recording, with plenty of clarity in the midrange and treble and some solid, well-defined bass. On the minus side, it can also be a tad hard and bright. And like many of RCA's "Living Stereo" recordings of the time, there is a wide stereo spread that sometimes borders on leaving a hole in the middle. (Although it doesn't, it can seem that way.) During quieter passages you may also notice some noise; not tape hiss exactly but more like tape deterioration. Most of the time it's masked by the music itself, so it's not much of a distraction. I said it was expensive: A list price of about $36 for a single disc holding fifty-three minutes of music, total. JVC take a good deal of care in their remasterings, and they make you pay through the nose for it. Still, they're making what to my ears are some of the best-sounding masterings of classical music around. This one from Munch is a classic from way back, and paying the price may one's only chance of getting it done absolutely right. Or, at the price, you'd better convince yourself it's right. 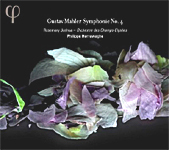 Carpenter: Adventures in a Perambulator; Sessions: The Black Maskers; Ives: Symphony No. 3. Howard Hanson, Eastman-Rochester Orchestra. HDTT HDCD216. You may recall that HDTT (High Definition Tape Transfers) is the company that transfers older stereo recordings from the Fifties and early Sixties, recordings in the public domain, to compact disc and digital download. They do this with meticulous care, offer their handiwork in a variety of formats to meet most budgets in a form that most often sounds better than their commercially available tape and LP counterparts. You may also know, especially if you are of an audiophile bent, that Mercury made some of the finest classical recordings of all time during the Fifties and Sixties, using simple microphone techniques and three-track tape, releasing their LP's and tapes under the Mercury Living Presence label. Today, collectors much prize these products. In fact, the Mercury recordings were so good that during the Eighties and Nineties Philips Classics painstakingly transferred them to CD and SACD from the original master tapes, including separate discs of the Carpenter, Sessions, and Ives performances gathered together here by HDTT. Which brings up the question: If these performances are already available on CD in such good shape, what's the point of this HDTT remaster, unless the sound is even better than Mercury provides or unless a person is looking for this particular combination of music? The answer is a little of both. HDTT culled the three selections on this disc from several Mercury albums, the first item being Adventures in a Perambulator, a delightful suite by American composer John Alden Carpenter (1876-1951). Carpenter wrote the work in 1914 for the Chicago Symphony, using his own child, Ginny, as the inspiration for a day in the life of a baby. It's divided into six movements depicting various encounters the baby has as her nursemaid pushes her perambulator (baby carriage) around the city. 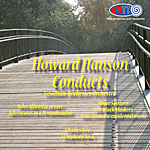 The music is highly descriptive, charming, fun, and accessible, especially the way noted teacher, composer, and conductor Howard Hanson plays it with his accomplished Eastman-Rochester Orchestra. The performance is filled with vivacity and humor, my own favorite, the child's meeting with the hurdy-gurdy man, wonderfully colorful. American teacher, critic, and composer Roger Sessions (1896-1985) wrote The Black Maskers, a suite in four movements for large symphony orchestra, in 1923, revising it in 1928. Sessions based his little tone poems on a Russian play by symbolist Leonid Andreyev, a play about the human spirit under attack from sinister and mysterious forces. It's a dark, moody, sometimes eccentric piece of music with a ton of melodramatic flourishes, the complete opposite in tone from the lighthearted Carpenter work yet almost as entertaining in its way. Maybe that, too, is thanks to Hanson, who does his best persuading us to take it all seriously and keep a straight face in the process. HDTT used Mercury 2-track tapes for the Carpenter and Sessions transfers and a 4-track tape for the Ives. Recorded at the Eastman Theater in Rochester, New York, in 1956 and 1957, the sound on all three pieces is vivid and alive, with a very wide stereo spread, brilliant transients, and deep bass. However, the 2-track sources sound superior for their greater clarity, air, and dynamics; they can appear a trifle bright in spots, but they make up for it in the extreme clarity of their presentations. There's an obvious similarity of sound in the three selections, given that Mercury recorded them in the same place with the same orchestra at around the same time, so any differences we hear we can probably attribute to the transfer sources. In comparison to Mercury's own remastered CD's, the HDTT disc is distinctly better in the Carpenter and Sessions material, not as obvious in the Ives. Still, in my own comparisons, the HDTT selections were better defined, more or less, in all three works, and with greater left/right stereo separation to boot. Believe me, this is absolutely remarkable sound for recordings made over half a century ago, sound that surpasses almost anything recorded today. Seattle Symphony Board Chair Leslie Jackson Chihuly and Music Director Designate Ludovic Morlot today announced the 2011–2012 Seattle Symphony Season, marking Morlot's first season as Music Director, and current Music Director Gerard Schwarz's first season as Conductor Laureate. "I am inspired and thrilled to unveil the first season designed by our next Music Director, Ludovic Morlot," Chihuly stated. "It is a spectacular season full of exciting new repertoire along with treasured favorites. I know that everyone in our community will want to take part in what Seattle Symphony has to offer, from our free Day of Music community event this September, to any number of the magnificent concerts we will present." "To use an Americanism, I'm champing at the bit," Morlot commented. "I can't wait to make music with my colleagues in this excellent orchestra, have these programs vividly come to life in Benaroya Hall and to share them with the city. My family and I couldn't be more excited about moving here and becoming Seattleites." Simon Woods, who becomes Seattle Symphony Executive Director in May 2011, said, "Ludovic Morlot's eclectic embrace of an enormous range of musical styles is strongly in evidence in this wonderful season, and will bring something very special to the Seattle region and indeed to American musical life in general. This is a pivotal moment for this dynamic organization, and it is an enormous privilege to be able to work with Ludovic—and of course with Gerard Schwarz in his new role as Conductor Laureate—as we march into an exciting future together!" The Opening Night Concert & Gala honoring Morlot's Inaugural Season as Music Director will be held on Saturday, September 17, and will feature former Seattle Symphony Principal Cellist and local favorite Joshua Roman as soloist. Morlot will conduct Beethoven's Consecration of the House Overture, Gulda's Concerto for Cello and Wind Orchestra, Gershwin's An American in Paris and Ravel's Boléro. The Masterworks Season is the core of Seattle Symphony's repertoire, and next season nine of its 21 weeks will be conducted by Ludovic Morlot. The series opens with September performances of Frank Zappa's Dupree's Paradise from The Perfect Stranger, Henri Dutilleux's The Tree of Dreams with violinist Renaud Capuçon, and Beethoven's Symphony No. 3, "Eroica," conducted by Morlot. The series concludes in July when Morlot leads performances of The Planets – An HD Odyssey, featuring state-of-the-art, high-definition images from NASA's exploration of the solar system, originally created by the Houston Symphony. Additional Masterworks Season highlights include Stravinsky's The Rite of Spring; Berlioz's The Damnation of Faust, featuring Seattle Symphony Chorale, Northwest Boychoir and distinguished soloists; Rachmaninov's Piano Concerto No. 3 with soloist Stephen Hough; Ives' Symphony No. 2; Brahms' Violin Concerto with soloist Jennifer Koh; and Chopin's Piano Concerto No. 2 with Marc-André Hamelin. Also featured next season are composers whose works are new to Seattle Symphony, including Henri Dutilleux, Oliver Knussen and Nico Muhly. Dutilleux's compositions, described by the Los Angeles Times as occupying "a sonic world of [their] own," feature prominently on the Masterworks Season with performances of: The Tree of Dreams with violinist Renaud Capuçon; Cello Concerto, A Whole Remote World, with cellist Xavier Phillips; and Symphony No. 1. His works for small ensemble will also be explored by a number of Seattle Symphony musicians performing on the Chamber Series next season. Oliver Knussen will conduct his own Violin Concerto on the Masterworks Season, with guest violinist Leila Josefowicz. Additionally, Knussen's works will be explored on the Chamber Series. A world premiere by 29-year-old Muhly will be performed during the Masterworks Season, conducted by Ludovic Morlot. Following 26 years as Music Director, Gerard Schwarz will become Conductor Laureate in the 2011–2012 Season. Schwarz is widely known for leading Seattle Symphony to international prominence by raising the artistic quality of the Orchestra, advocating for the construction of the acoustically excellent Benaroya Hall, generating more than 140 recordings, and garnering 12 Grammy nominations. Also, Rhapsody on Ukrainian Themes. Shorena Tsintsabadze, piano; Dmitry Yablonsky, Russian Philharmonic Orchestra. Naxos 8.570783. Another name I'd never heard of. So, who is Sergey Mikhaylovich Lyapunov? He was a Russian composer (1859-1924) "strongly influenced," as the album jacket notes, "by Mily Balakirev, leader of the 'Mighty Handful'" of Russian nationalist composers who dominated Russian composition for a time. 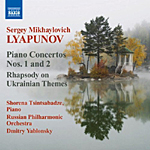 People probably know Lyapunov best for his two symphonies and for the three pieces recorded here: the two piano concertos and the Rhapsody on Ukrainian Themes. The program begins with the Piano Concerto No. 1 in E flat minor, Op. 4 (1890), performed by Georgian pianist Shorena Tsintsabadze, with the familiar conductor and cellist Dmitry Yablonsky leading the Russian Philharmonic Orchestra (originally a recording ensemble made up from leading members of Russia's most-famous orchestras and now often a separate entity unto itself). The concerto is in a single, twenty-two-minute movement, although it follows a traditional arrangement of alternating sections. It's quite Romantic in nature, with big, boisterous segments and typically lyrical ones; yet it doesn't contain anything particularly remarkable or memorable. In other words, it's enjoyable while you're listening to it but just as easily forgotten. The Piano Concerto No. 2 in E major, Op. 38 (1909) is a more formidable affair. It, too, is in a single movement, this time slightly shorter and more concise. It opens with a long, gently flowing theme, quite attractive and bucolic, which emphasizes Ms. Tsintsabadze's delicate virtuosity more than anything else on the disc. Following this opening section is a good deal more ornamentation by the soloist in segments that continuously transition from slow to fast to slow, with cadenzas galore. It's almost too much of a good thing, finally leading to hints of Tchaikovsky and Liszt. Although there is a lot to like in the work, it probably goes in too many different directions to connect with every listener. The program concludes with the Rhapsody on Ukrainian Themes for piano and orchestra (1907), a piece in rondo form with a pleasant pastoral theme returning several times, interspersed with a few country dances. Frankly, I enjoyed this music with its exotic Rimsky-Korsakov overtones as much as anything on the album, not only for the endless tunes but for Ms. Tsintsabadze's sensitive playing and Maestro Yablonsky's alert direction. 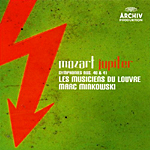 Naxos recorded this 2010 release in Studio 5 of the Russian State TV and Radio Company, Moscow, in March of 2008. While the imagery lacks depth, it does spread out nicely between the speakers, and the slightly soft sonics are smooth and pleasant on the ear. The piano may be a tad too close, but transparency, dynamics, and frequency response are more than adequate, with some satisfying bass thumps along the way. Henri Ledroit, Anne Azema, Ellen Hargis, Richard Morrison, William Hite, and Andrea von Ramm; Joel Cohen, The Boston Camerata. Warner Classics Erato 2564 69634-0. Tales of the brave Cornish knight Tristan (alternatively, Drystan, Tristrem, Tristram, depending on the country of origin and/or the translation) and his ill-fated love for the Irish princess Iseult (Isolde, Yseult, Isode, Isoude, Esylit, or Isotta) have been around at least as long as the Arthurian legends, maybe before them, meaning that bards, prose writers, poets, and singers have told and retold the legends many times over for the past 1500 years or quite possibly longer. Although the original storytellers set their accounts in Cornwall, probably nobody wrote them down (nobody we know of) until hundreds of years later, mainly French and German writers before the English took them up again. 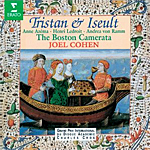 What we have under review here is a recent Warner Classics reissue of the award-winning 1987 Erato recording (it won the Grand Prix du Disque in 1989) of medieval poems, songs, and music associated with the Tristan and Iseult legends, compiled by Joel Cohen and played by The Boston Camerata. It certainly makes for different and fascinating listening. According to Maestro Cohen in a booklet note, "The Camerata has chosen to return to the oldest surviving sources for this program. You will hear some central elements of the story almost exactly as they were narrated in the Middle Ages in Germany and France. In our presentation, certain passages of the narration are spoken; others are sung to melodies of the same period, as was often the case with narrative poetry during the Middle Ages. All the music is drawn from manuscript sources of the early and later medieval period; about half of these songs were already associated with the 'Tristan' legend at the time, and the others are closely related in mood and content." 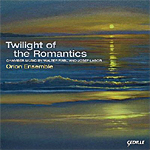 The music begins with an anonymous prologue, partly instrumental, partly recited, which sets the temper of the tragic romance in a lyrically atmospheric manner. From there we get an eclectic assortment of instrumental, ensemble, and solo pieces, mostly plaintive, melancholy, some bright and sprightly, each connected by narration, twenty-four selections in all, ranging from under a minute to over six minutes apiece. The overall tone of the music, not surprisingly, sounds Celtic and most of the narration Germanic, French, and Old English. Countertenor Henri Ledroit is a particularly becoming Tristan, Anne Azema a tender Iseult, Richard Morrison a convincingly lusty King Mark, and Andrea von Ramm a sensitive narrator. While I don't think anyone would mistake this collection of medieval music for Richard Wagner's celebrated opera, it does have the merit of at least some degree of authenticity. And you can hardly beat those ancient settings of the texts. It's fun in a fresh and pleasant way. Erato recorded the program in September of 1987 at the Church of the Covenant, Boston, Massachusetts. Even though the sound is fairly close up and somewhat one-dimensional, it has the advantage of exceptional naturalness and clarity. Voices, which on many recordings can appear bright and forward, here seem just right--smooth yet vivid, with ensemble vocals given a small degree of room resonance for an effectively realistic ambience. Transient attack is quick and sharp, rendering the whole affair easy on the ear. 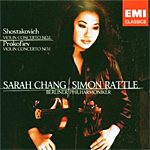 Sarah Chang, violin; Sir Simon Rattle, Berlin Philharmonic. EMI 0946 3 46053 2. You'd think the First Violin Concertos by two of twentieth-century Russia's premier composers would be pretty much alike, especially as both Shostakovich and Prokofiev before him were in the vanguard of the modernist music movement. Wrong. The works couldn't more dissimilar. Dmitri Shostakovich completed his Violin Concerto No. 1 in 1948 as a protest against Soviet repression, among other things, but nobody performed it publicly until 1955 because the Soviet government branded the composer an enemy of the people for writing music that did not conform to the state's puritanical tastes. The Concerto is understandably harsh, beginning with a dark, ominous bass passage, followed by vigorous sections of bottled-up rage, a somber Andante, a relatively ferocious Cadenza, and an energetic Burlesque finale. Sergei Prokofiev completed his Violin Concerto No. 1 in 1917 but had to wait for the Russian Revolution and its aftermath to hear it performed in 1923. So much for similarities. Where the Shostakovich work is fairly long--five movements and almost thirty-seven minutes--the Prokofiev is brief--three movements and about twenty-one minutes. More to the point, the Prokofiev concerto is as light and airy as you could imagine, almost wispy in places, and filled with a lilting playfulness, lyricism, and good cheer. So, you might say one piece is a tragedy, the other a romantic comedy, and that's how violinist Sarah Chang plays them, pointing up the differences in temperament and style as much as possible. My own reaction is that she is more successful in the Prokofiev than in the Shostakovich, where her performance of the music doesn't seem quite as markedly pointed or biting as I've heard it interpreted. But I doubt that anybody is going to notice, let alone complain, especially not with such impeccable support by Sir Simon Rattle and his Berlin orchestra. Nor can one complain about EMI's sound, which the jewel box says derives from live recordings but which surely don't appear to be live. There is no audience noise whatsoever that I noticed (understand, I was caught up in the music most of the time), no applause, and no close or distant miking. The orchestra spreads out smoothly and naturally behind the soloist, presenting a most realistic sound stage. It's a fine production all the way around. Mark Fewer, violin; Myron Lutzke, violoncello; Kenneth Stowik, harpsichord. Smithsonian Chamber Music Society FoM 36-802. If you don't recognize the name of Italian Baroque composer Giovanni Antonio Pandolfi Mealli (c. 1630 - c. 1669), don't feel bad. Scholars didn't rediscover his music until 1901, and even then nobody in the music world took him too seriously until the 1980's. If you did recognize his name, give yourself ten extra points and move to the head of the room. The fact is, we know little about Pandolfi Mealli. All we have are two collections of his music, the two sets of violin sonatas (with harpsichord or, as here, with harpsichord and cello) labeled Opuses 3 and 4. Maybe he wrote a lot more music than that, maybe not. Maybe he wrote Opuses 1 and 2, maybe not. Known facts: He worked as a musician at the court of the Austrian Archduke Ferdinand Karl around 1660, which is about when he published the two collections of sonatas we have here, and he dedicated many of the sonatas to friends, relatives, and patrons. The term "sonata," incidentally, apparently meant something a little different in Pandolfi's day than it does in our own. Today we think of a sonata as "a composition for one or two instruments, typically in three or four movements in contrasted forms and keys," as the Random House Dictionary puts it. 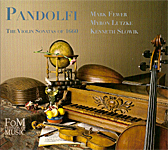 In Pandolfi's time, however, a sonata simply referred to any work written specifically for the violin repertoire and made up of relatively short contrasting sections. In the case of Opuses 3 and 4, they consist of six sonatas each, with each sonata lasting from three to eight minutes. Although there are tempo variations within the individual sonatas, each of them tends either to favor slow or fast paces; but because of their short length, Paldolfi alternates them for maximum effect. People can debate whether he intended this effect or not, but the fact is that the listener can enjoy each set of Opus numbers as a complete work unto itself. It's rather like listening to Vivaldi's Four Seasons as a complete set rather than four separate concertos. Of course, the six sonatas in each of Paldolfi's opuses don't hang together quite as well as Vivaldi's music, but you get the idea. When the sonatas are in their slow phases, they can range from contemplative to downright melancholy; when they are moving faster, they can appear bright and sprightly. The common denominator is their virtuosity, which the trio of Mark Fewer, violin, Myron Lutzke, cello, and Kenneth Stowik, harpsichord, bring out exquisitely with their exactitude and affection. These performances do not seem like stuffy run-throughs of ancient music but lively, spontaneous interpretations played in a smooth, casual, yet refined and ultraprecise style. Incidentally, this is only the second recording of the complete sonatas in the catalogue and the first one to include a cello. It's fascinating, really, to note how cultured and flowing the music is, how much more modern it sounds than the seventeenth century. This may be early-to-mid Baroque writing, but the works seem more like the compositions of the late Baroque or possibly early Classical periods. Even though there is nothing about them that stands out like hit-parade favorites, these tunes should appeal to most classical music lovers; especially the way Fewer and his companions play them. The sonatas are charming, almost-lost little gems, notable for their aforementioned virtuosity and for their endless ingenuity and creativity. The sound, recorded in October of 2008 at the Eglise Saint-Augustin, Mirabel, Quebec, is as ideal as one could want for a trio of players. The performers are simply there, in the room with you, each instrument sounding as clear and natural as it might sound on a stage or in a large room setting, with just enough ambient bloom to provide an added dimension of realism. Spacing, imaging, depth, frequency response, etc., are also ideal. It's some of the best sound I've heard from a chamber group. Also, Divertimento No. 7; Two Marches in D. Daniel Barenboim, English Chamber Orchestra. EMI 0946 3 50917-2 and 0946 3 50922-2 (two separate 2-disc sets). With so many competing sets of late Mozart symphonies to choose from, it's futile to recommend any single one as being best of all. But I will say that if I had to live with only one set, Barenboim's from the late Sixties, early Seventies would be high on my list of choices. This is not to say I don't have individual favorite conductors and orchestras in each of the works; yet while I may enjoy Jochum in No. 41, Klemperer in No. 40, Davis in No. 39, Krivine in No. 29, Marriner or Bernstein or Mackerras in some others, and so on, I can't think of another conductor beyond Barenboim who brings so much joy to all of the works equally. Yes, it may simply be nostalgia. After all, I've owned these Barenboim recordings on LP and CD for some forty years. But hearing them again in EMI's two low-priced 2-disc sets convinced me otherwise. They really are that good, both musically--interpretively--and sonically. And I continue to think that Barenboim's performances of Nos. 31, 35, 36, 39, 40, and 41 are among the best anyone has ever produced. They have vitality above all, the trim, athletic English Chamber Orchestra under Barenboim's conductorship producing remarkably fleet, lithe results. There is a grand scope to each piece that befits Mozart, a hushed tranquility in the slow movements, a proper proportioning of moods and contrasts, and a dynamic spark that sets them above the ordinary. Neither do the readings sound lackadaisical nor out of breath, but swift and youthful and occasionally playful, like Mozart himself when he wrote them. They are all of them a genuine joy to hear. On these mid-priced, reissued 2006 sets, the EMI engineers used the same 1991 transfers they had for the earlier full-priced CD set, and in comparison to the older discs they sound, as they should, alike. Fortunately, that is very good, indeed. These recordings may be four decades old, but they sound brand new. They possess a fullness, a richness, and a transparency that outshine most new recordings. I might add that the EMI producers have spread out the symphonies over the four discs as oddly as before, probably for reasons of timing. The first set contains Nos. 29, 30, 31, 33, 34, 38, and 39. The second set contains Nos. 32, 35, 36, 40, 41, the Divertimento No. 7, and the Two Marches in D. Whatever, they're a bargain. Also, Romeo and Juliet, excerpts. Kurt Masur, New York Philharmonic. Warner Classics 2564 67941-2. Since Warner Classics bought Teldec some years ago, they have been reissuing many of Teldec's older recordings. Such is the case with this 2010 Warner reissue of a Kurt Masur disc that Teldec made in 1994 and 1996 and released in 1997. The time frame was about in the middle of Masur's somewhat contentious tenure with the New York Philharmonic, a relationship that lasted from 1991-2002, and the disc underscores some of the man's best and worst qualities as the orchestra's conductor. Let's start on a positive note with the best the album has to offer, excerpts from Prokofiev's Romeo and Juliet ballet. Russian composer Sergei Prokofiev (1891-1953) wrote this ballet as a commission from the Kirov Theater, premiering it in 1938. Based on Shakespeare's play, it remains one of the composer's most-popular pieces of music. On this recording, Masur gives us about twenty-six minutes from the complete score, highlighting the most familiar territory of the Bard's story. In Romeo and Juliet Masur creates power and intensity from the opening bars. Things begin with the introduction to "The Montegues and Capulets," the warring families in old Verona, with the conductor making the scene appropriately abrasive and belligerent. Then we get "Juliet as a Young Girl," which Masur handles most delicately. The conductor presents "Masks," from the party sequence, playfully, and we can easily imagine Romeo and his friends obviously clowning around. Next comes the centerpiece, the ultraromantic "Romeo and Juliet." It's the longest and most-touching music in the ballet, even if it doesn't have the dramatic flair Tchaikovsky gave it in his famous overture. Still, it's close enough, and Masur handles it with subtlety. The music closes with "Tybalt's Death," followed by the scene at "Romeo and Juliet's Grave." Here, Masur takes us from the action and excitement of the duel in the streets to the tragedy of the young couple's death. Perhaps the fight could have used a bit more adrenaline, but it's certainly colorful. And, saving the best for last, the final scene is as heartbreaking as Shakespeare and Prokofiev intended. OK, while I continue to prefer the complete recordings with Previn and LSO (EMI) and Maazel and the Cleveland Orchestra (Decca), and the excerpts alone on an audiophile disc with Leinsdorf and the L.A. Philharmonic (Sheffield), Masur does manage to keep pace. However, there is always the negative side to the album. 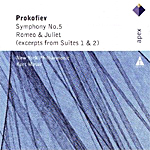 Next to Prokofiev's First Symphony, the Fifth Symphony, 1944, is probably the most well liked of his seven symphonies. Yet under Masur it sounds somewhat dry and pedestrian. The composer called the work "a symphony about the spirit of man," his response to the turmoil of World War II. As such it opens with the anguish of that nightmare. Only Masur presents it so matter-of-factly, it loses some of the pain it should represent. Nor does Masur seem fully to capture the sarcasm of the rhythmic second-movement Allegro. The long, brooding Adagio shows what the conductor is capable of and does display some degree of emotional intensity. However, the concluding movement, which should end the piece in triumph, comes off too pat and, consequently, too shallow. As a result, it's hard to say the music ever moved me. As for the sound, the best selections on the disc come in the Romeo and Juliet excerpts, studio recordings from 1996. Still, the sound is not great. Although the dynamics are excellent and the bass strong and deep, the treble is a tad too edgy for my taste; and although the midrange response is adequate, the highs and lows on both sides tend to overshadow it. Teldec recorded the Symphony No. 5 live in 1994, and it is even less successful than the Romeo and Juliet tracks, with a number of audience noises in the background and the orchestra miked too closely. In addition, not only is the sound too up-front, it's slightly harsh. Perhaps the engineers felt this suited the tone of the music; I don't know. I didn't enjoy it. Furthermore, the CD's minimalist presentation didn't impress me, either, with no pictures anywhere, virtually no color, and no booklet notes. Well, at least Warners offer the disc at mid price, and various Web sites discount it considerably. Ruth Ziesak and Mojca Erdmann, sopranos; Christian Elsner, tenor; Jun Markl, MDR Symphony Orchestra and Radio Choir. Naxos 8.572294. Felix Mendelssohn (1809-1847) wrote his Symphony No. 2 "Lobgesang" ("Song of Praise") to commemorate the 400th anniversary of the Gutenberg printing press, and it was apparently quite a success at its première in 1840. Today, Mendelssohn's Third and Fourth Symphonies, with their simpler structures and catchier tunes, tend to overshadow the Second by quite a ways, but there's no denying the Second is big. After all, there wasn't just the printing press to think about, there was that whole Gutenberg Bible thing to honor. So Mendelssohn wanted the music to be grand, nay, grandiose, and may have used no less than Beethoven's Ninth Symphony as his model. Certainly, the present disc from Jun Markl and company catches much of that momentous quality the composer was striving to realize. Because this is Mendelssohn, after all, we still get an abundance of memorable melodies, beginning with the long opening Sinfonia, which Markl takes at a commendably jubilant clip. This music gets the piece off to an encouraging start in the manner of a full-blown, curtain-raising overture. Mendelssohn described his Second Symphony as a "symphony-cantata," that is, a choral oratorio with full orchestral accompaniment, so the opening movements are purely instrumental, followed by a series of sung texts based on the Luther Bible. Throughout the work we get suggestions not only of Beethoven but of Bach. Nevertheless, we mostly hear pure Mendelssohn, who along with Schubert was one of the most tuneful composers who ever wrote. Markl seems to take a special delight in the perky second movement Allegretto, and then offers up a most serene and spiritual Adagio religioso. When the choir enters in the fourth segment, they sound glorious, and the soloists sing radiantly in subsequent passages. 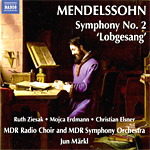 Mendelssohn accomplishes his goal of praising Gutenberg and God, and Markl and his musicians accomplish their goal of making it all as thrilling, inspirational, and accessible as possible. The disc is an impressive achievement all the way around. 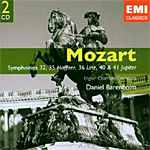 Releasing the disc in 2010, Naxos recorded the music in Leipzig, Germany, in 2008, producing a sound that is appropriately massive, the orchestra and chorus filling the room from end to end. More important, it's largely good, clean, clear sound, with just enough ambient bloom to provide a realistic concert-hall feeling. Stage depth is fine, dynamics acceptable, and voices, while a tad thick, fairly natural. On the whole, the CD makes an enjoyable listening experience. Also, Francesca da Rimini. Leopold Stokowski, London Symphony Orchestra. Pentatone Classics 5186 122. I know I've mentioned this before, but it bears repeating so stick with me. In the 1970s, Philips and several other record companies jumped on the quadraphonic bandwagon and made a number of recordings in four-channel sound. However, because of the limitations in playback equipment back then, it was difficult to appreciate the advantages that multichannel sound brought to the table. Philips eventually released their quad recordings in ordinary two-channel stereo and laid the multichannel tapes to rest. Until more recently, that is, when SACD opened the door once again to multichannel audio. 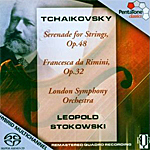 This Stokowski/LSO release of works by Tchaikovsky comes from 1974, and for the first time since its recording Pentatone Classics present it in its original four-channel configuration. Unfortunately, neither the SACD sound nor the Stokowski performances are anything to write home about. Playing the recording in SACD, I thought the audio more than a little soft, round, billowy, and overblown. Moreover, I found the performances of both the Serenade for Strings and the tone poem Francesca da Rimini less than inspired. However, it isn't that Stokowski doesn't take the works at a quick enough tempo, bring out enough beauty, create enough excitement, or play without enthusiasm. Stokowski does. It's just that despite everything, the performances seem perfunctory, ordinary, which is something wholly uncommon to a conductor like Stokowski. One has to remember, though, that Stokowski was in his nineties when he made the recording, just a few years before his death. Although he had not lost his zest for conducting, he may have lost just a little something in the way he shaped the works. The best example of this is a comparison of the newer recording of Francesca da Rimini with one he made in 1959 with the Stadium Symphony Orchestra of New York (the summer festival name for the New York Philharmonic), last issued on a 20-bit remastered Everest disc (EVC 9037). Of course, Stokowski was still a youngster at the time, merely in his late seventies, but he filled his reading back then with more life, more vigor, more robust tensions than he did in 1974. And the interesting thing is that the earlier recording is almost a minute longer than the newer one, so as I said, it's not a matter of the old man slowing down. Furthermore, the earlier, 1959 stereo recording sounds more transparent and more dynamic than the 1974 one reviewed here, possibly because it doesn't have the four channels to contend with. Anyway, I doubt that anyone will mind the Pentatone SACD (a hybrid, by the way, that one can play back on a regular CD player in two-channel sound), and Stokowski fans will want it in any case. Diversions Overture; Berceuse; Sinfonietta; Symphony in One Movement: Threnody. JoAnn Falletta, London Symphony Orchestra. Naxos 8.559652. 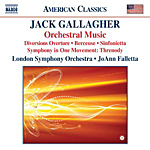 If you don't immediately recognize the name of American composer Jack Gallagher (b. 1947), you probably aren't alone. Professor Gallagher, who teaches music at the College of Wooster in Wooster, Ohio, cannot boast the world's biggest resumé of compositions nor the biggest discography of recorded performances. What he can be proud of is the variety and creativity of his music, which this current Naxos disc well represents. I mean, when so distinguished a conductor as JoAnn Falletta, so celebrated an orchestra as the London Symphony, and so big a record company as Naxos feel confident in a composer's work, you know you've got to sit up and pay attention. Without any previous experience with the composer or with performances of his work, it's hard to know how good this new Naxos disc is. However, Ms. Falletta seems to have taken a shine to the music, and the London Symphony play it with their customary attention and enthusiasm. I've read that the LSO are a quick study and have recorded more music than any other orchestra, so I can understand their handling the material as well as they do. The program opens, appropriately, with an overture, a curtain-raiser, in this case the Diversions Overture (1986). Dr. Gallagher named it fittingly, as it expresses a wide range of diverse temperaments. It opens gently with a Copland-like sunrise that sets the mood. Then it gets progressively more energetic as it moves along, perhaps by high noon getting downright rambunctious. The percussion instruments, especially, make an exciting partner in the proceedings before everything settles back into a comfortable repose. The next item is Berceuse (1977), by definition a composition having a soothing, reflective character. It's a short piece for small orchestra, a piece the composer describes as starting out as a lullaby for piano. Again, we hear Gallagher's penchant for sweet, lyrical tones, a really lovely work reminiscent to me of several early twentieth-century English pastoral composers--Arnold Bax or Frank Bridge, for instance. The Sinfonietta (completed in 2008) is the longest and most-ambitious piece on the disc, written in five movements and scored for string orchestra. It's the middle sections I found most interesting: a hauntingly atmospheric Intermezzo; a spirited Malambo based on an Argentinean dance; followed by a calming, courtly Pavane. Then the music ends with a robustly melodic Rondo concertante. The album concludes with Symphony in One Movement: Threnody (1991). A "threnody" is a song of grief, usually written for a funeral, so the music is both sorrowful and uplifting. Because the music is about twenty-one minutes long, Gallagher divides it into two segments, the first slow, yearning, and eerily melancholy; the second faster and more assertive, with percussive passages breaking out unexpectedly throughout both sections, though more flamboyantly in the closing moments. The forward thrust of the piece makes it quite enchanting and belies the mournful cast of its title. These selections from Dr. Gallagher's body of work strike me as having great heart and emotional intensity, without resorting to gimmicky, abrasiveness, or sentimental condescension. They are at once modern yet old-fashioned in their harmonies, melodies, and rhythms. I have no doubt they would appeal to most listeners of almost any age, particularly when the conductor and orchestra play as ardently as they do here. Naxos recorded the music at Abbey Road Studio One in 2009. As usual in this venue, we get recorded sound with a wide stereo spread, a modest but adequate sense of orchestral depth, and a more-than-ample dynamic range and impact. The audio engineers also handle frequency extremes well, with clear, extended highs and taut, solid bass. One forgoes ultimate midrange transparency for a pleasant ambient bloom, a fair compromise. 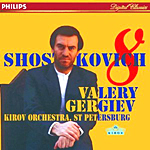 Valery Gergiev, Kirov Orchestra, St. Petersburg. Philips 446 062-2. What is clear is that if you already own Previn's 1973 EMI recording of the Shostakovich Eighth, you probably don't need any others. It is still among the best performances and best recordings available. If you don't own it or can't get it, this one by Valery Gergiev and the Kirov Orchestra (and several other alternatives) may fit the bill. What is unclear is why Philips rereleased this 1995 Gergiev recording a couple of years ago at full price after releasing it originally in 1996. Shostakovich premiered the Symphony No. 8 in 1943, and critics consider it the composer's great war epic. However, Shostakovich considered the work to represent not only World War II but the Soviet Union itself, which may explain why the Soviet authorities immediately banned it. The symphony's unrelentingly pessimistic tone and turbulent harmonies led the government to denounce it as decadent and degenerate, unfit for the masses, and it was many years before the work got its proper recognition. Well, it certainly wasn't Tchaikovsky. Any recording of the Eighth must not only evoke the massive emotional turmoil of war, but it must also compete against one of the most remarkable interpretations of our time, the aforementioned Previn performance. Not even Previn's own newer DG remake quite captures the urgency of the older recording, so it is with some pleasure that I so enjoyed the success of Gergiev's new release, which is almost as good. Almost. But as powerful as it is, the Gergiev recording still doesn't quite capture the sense of overwhelming doom and devastation that the older Previn disc does. This is particularly evident in the middle movement's pulse-pounding rhythms and the Largo's sinister overtones, which Previn makes just that much more gripping than Gergiev does. Nor does the Philips sound appear quite so focused, markedly deep, or well imaged as EMI's. The newer Philips digital sonics, recorded by Philips in the Concertgebouw, are slightly warmer in the lower midrange, slightly more forward in the upper midrange, and slightly more grainy overall than EMI's, although the recording is marginally wider in stage width, with a touch wider dynamics and more ambient bloom. Both recordings, along with Haitink on Decca and the older Mravinsky performance on BBC, are worthy tributes to Shostakovich's vision of the futility of war and dictatorship. Rosemary Joshua, soprano; Philippe Herreweghe, Orchestre des Champs-Elysees. PHI LPH001. When Austrian composer Gustav Mahler (1860-1911) premiered his Symphony No. 4, neither the critics nor the public accepted it very well. That may come as a surprise to many of us today because it's such a familiar work in the catalogue, maybe Mahler's most popular piece of music. If I had to guess why the Fourth has become so favored over the years, I'd say it's because the work is so accessible, so tuneful, and so mature. Just as important, the music is big yet intimate, making recordings of it ideal for audiophile playback in the home. Plus, listeners seem to appreciate the contrasts in the music, going from grand, eloquent sections to quiet, personal passages, from deadly serious to mischievously satiric. There is no doubt that a lot of folks have discovered Mahler's music is one heck of a great way to enjoy themselves and show off their stereo system. In any case, Mahler is back yet again, this time from maestro Philippe Herreweghe and the Orchestre des Champs-Elysees. As he had done in his first three symphonies, Mahler clearly intended his Fourth to mean something more than absolute, nonrepresentational music, and although he left no descriptive program, he did provide enough specific instructions for each movement that people get the idea. One of his followers, conductor Bruno Walter, had this to say about the symphony: "In the Fourth, a joyous dream of happiness and of eternal life promises him, and us also, that we have been saved." The first movement, which Mahler marks as "gay, deliberate, and leisurely," begins playfully and hopefully with the jingling of sleigh bells. The second movement introduces Death into the scene, with a vaguely sinister violin motive. The slow, third-movement Adagio, marked "peacefully," is a kind of respite from the oddities of Mr. Death in the previous section. And the fourth and final movement is Mahler's vision of heaven and salvation as exemplified in the simple innocence of an old Bavarian folk song, a part of the German folk-poem collection Das Knaben Wunderhorn that Mahler loved. Here, the composer wanted the movement to sound so unaffected he insisted upon the soprano's part being sung with "child-like bright expression, always without parody." The interesting feature about this new recording from Herreweghe is that his orchestra plays on period instruments. Nowadays, we find this treatment commonplace for eighteenth and nineteenth-century works, but Mahler premiered the Fourth Symphony in 1901, and because it never really caught on until later in the twentieth century, we've become used to hearing it played with modern orchestras. Yet Herreweghe's approach has merit, and his gut strings are in no way harsh, even though they tend to dominate the proceedings more than in a contemporary orchestra where the winds and brass have a stronger role. Nevertheless, the percussion section plays an important part in the sound and, while the percussion never overpower the other instruments, they are definitely in the forefront of the activity with their distinctly period flavor. Anyway, Herreweghe's performance itself is convincingly unmannered, fluent and fluid, with an always graceful forward momentum, never rushed. Nor does the conductor ever fall into the throes of gaudy Romanticism, even in the serenity of the third movement, which simply floats lightly above our heads. Indeed, this may be the most-tranquil reading of the slow movement on record (though not the slowest by any means), making the big climactic segment all the more startling for its juxtaposition. Finally, the piece closes with soprano Rosemary Joshua singing the angelic part in an appropriately "child-like" manner without especially seeming "child like." Herreweghe's interpretation is remarkably gentle and one that with its period instruments offers a different, colorful, and rewarding approach to an old warhorse. Recorded in Grenoble, France, in 2010 for Herreweghe's own, newly formed PHI label, the sound immediately strikes one as rich, lush, and ultrasmooth. Its warmth makes for a most-pleasant and realistic listening experience, although the soft, ambient bloom does tend to obscure some inner detailing. So, no, while the sonics are certainly natural sounding, they aren't as transparent as on a few competing recordings. Then, too, orchestral depth and overall dynamics are only moderate, which is still all right since the music and the performance are mostly relaxed and easygoing in any case. Of minor note: The booklet lists the final movement at 6:41 minutes. It isn't; it's 8:41 minutes and actually more conventional in its pacing than the incorrect timing suggests. Don't be afraid that Herreweghe is trying to race through anything. Music for wind band. Col. Lowell Graham, USAF Heritage of America Band. Klavier K 11171. Almost any music for a wind band, save possibly marching music, may be an acquired taste, and it's a taste I admit I have not quite fully acquired. Nevertheless, when a group plays the music as well as it's played here by one of America's top-notch wind ensembles and a company records it as well as recorded here, it's hard not to appreciate its power and eloquence. 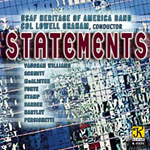 Even though I didn't particularly care for some of the compositions on the disc, the United States Air Force Heritage of America Band, conducted by Col. Lowell Graham, make a strong case for this kind of music, and a case that's hard to knock. The nine short selections for wind band presented on the album all derive from the twentieth century, with many of them from the latter half. So these are fairly modern "Statements," as the disc's title suggests, not special arrangements of eighteenth or nineteenth-century creations. Varying in length from about one to sixteen minutes, the compositions comprise a well-rounded, representative selection of music for the genre. The program begins with two selections from English composer Ralph Vaughan Williams (1872-1958): "Flourish for Wind Band" and "Toccata Marziale," both of them sounding traditional but enlivening. Following them we hear a more ambitious piece by a less well-known contemporary of Vaughan Williams, Florent Schmitt (1870-1958) called "Dionysiaques," which offers up a wonderfully festive mood. Next, we get three more-recent pieces written especially for Col. Graham and the USAF Heritage Band: Clark McAlister's "A Summer Flourish," Aldo Forte's three-movement "Dance Suite on Spanish and Latin Rhythms," and Jack Stamp's "With Trump and Wing." Of the three, I enjoyed the takes on Spanish and Latin rhythms best and could easily recommend the disc for this suite alone. After those numbers, we get the "Commando March" by Samuel Barber (1910-1981), a rousing foot stomper; followed by another piece written for the Air Force Heritage Band, this one a four-movement symphony by Vincent Persichetti (1915-1987) called Symphony for Band (No. 6). It's the longest (sixteen minutes, still short) and most serious of the works on the disc. As such, it seemed to me the least interesting. Klavier issued the present 24-bit digital recording in October, 2010, taken from sessions made between 1994 and 1996 and mastered by noted audio engineer Bruce Leek. It is as ideal a wind-band presentation as you'll hear: smooth, dynamic, and wide-ranging, with plenty of hall bloom, a broad stereo spread, and an excellent sense of depth. Midrange clarity is outstanding, while bass is deep and taut and highs well extended. It makes an easy audiophile selection. Also, Divertimento in D; others. Anton Steck, Concerto Koln. Archiv 00289 477 5800. Over the past quarter century or more, I have come to respect and in some cases love the performances of period-instruments bands. But it does seem to me that they can sometimes put such a stress on what they consider authenticity, they lose sight of the fundamental warmth of a piece. Thus it is with some of the work I've heard from Concerto Koln. The members of the ensemble play with vigor and enthusiasm, and they appear to play flawlessly. Yet too often on this album of short, diverse Mozart works, they seem to be racing Europa Galante to the finish line. The playing is stimulating, sometimes heart pounding with excitement, while at the same time draining the music of much of its charm. OK, perhaps one has to give up sometime to gain something else, and certainly at the pace Concerto Koln perform these works they set themselves apart from most others. But it doesn't mean everyone has to like it. Things begin with the overture to Mozart's opera Die Zauberflote, and it's here, right at the start, that we notice the direction the musicians are taking. They are clearly going for an adrenaline rush and, I believe, they are missing Mozart's innate charisma. For instance, The Magic Flute is just that, a magical journey filled with an assortment of fascinating enchantments, yet Concerto Koln play it at something more like a concerto rock: Big, long pauses, enormous dynamic contrasts, and breathtaking tempos. The proceedings slow down a bit with excerpts from Le Petits Riens and the Adagio from the Serenade in B flat major, but then it's off to the races again in the Divertimento in D major. The overture to Der Schauspieldirektor has the effect of a blockbuster, and Eine kleine Nachtmusik seems purposely aimed at being anything but than traditional. 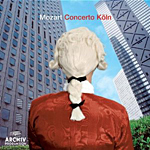 I suppose one can say these performances make people listen to the music with new ears (note the album cover), but, then, that isn't always what people want in their Mozart. While it is easy for me to nitpick the interpretations, I can hardly fault the sound. It is natural, well balanced, and generally clean and clear, with a nice sense of breadth and depth for a group of musicians less than twenty strong. It is only when comparing the Divertimento in D to Marriner's old account remastered on an FIM XRCD that one notices that maybe the new digital recording could be a tad more open and transparent. The FIM will knock you over, and Marriner's reading is every bit as spirited and lively as Concerto Koln's, yet at the same time it is elegant and refined. So, yes, other folks have shown they can do it.